A new report from Deadline assesses the female-heavy future of superhero cinema, from Black Widow to Birds of Prey, and among the various insights and revelations on Marvel and DC’s future plans is news of a familiar figure suiting up for Avengers 4. 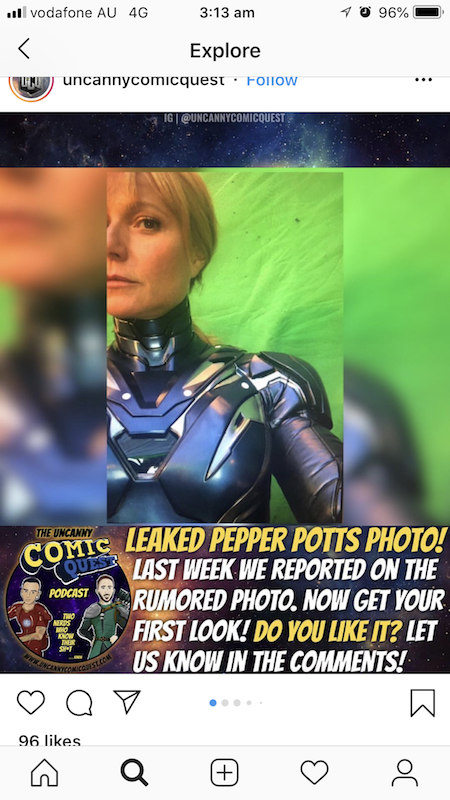 If you’ve been keeping track of the various leaks from the set of the upcoming Avengers: Infinity War sequel, then there’s a good chance you’ve seen the image of Gwyneth Paltrow in an Iron Man-style outfit. With rumors already making the rounds that Tony Stark’s fiancée Pepper Potts would finally be assuming the Rescue persona, many fans took the photo as conclusive proof that hearsay was correct, and with good reason. Granted, the report never actually uses the term “Rescue,” but even if Pepper goes the whole of Avengers 4 without adopting the name, it’s pretty clear where the film’s inspiration is coming from. Of course, this development still leaves us with plenty of questions. For one thing, it’s unclear whether this Rescue persona will be a one-movie occurrence, or if Marvel are hoping to make a long-term hero out of Pepper. It remains a popular prediction that next year’s release will be Tony Stark’s final film, so surely we can’t rule out the possibility of Iron Man’s partner serving as his MCU successor. After all, Marvel Studios head Kevin Feige claimed earlier this year that the majority of superheroes in the franchise would soon be women, suggesting that Captain Marvel won’t be the only female regular to join the fight in the near future. In any case, we’ll find out how Pepper fares in the field of battle when Avengers 4 hits theaters on May 3rd, 2019.